This is a scalable context timeline. It contains events related to the event September 5, 2001: Oklahoma Will Continue Prosecuting Convicted Oklahoma City Bombing Conspirator. You can narrow or broaden the context of this timeline by adjusting the zoom level. The lower the scale, the more relevant the items on average will be, while the higher the scale, the less relevant the items, on average, will be. Entering the City - McVeigh drives into Oklahoma City, entering around 8:30 a.m. from his overnight stop in Ponca City, Oklahoma; the details reported of his entrance into the city vary (see 7:00 a.m. - 8:35 a.m., April 19, 1995). At 8:55 a.m., a security camera captures the Ryder truck as it heads towards downtown Oklahoma City [Douglas O. Linder, 2006] , a sighting bolstered by three people leaving the building who later say they saw the truck parked in front of the Murrah Building around this time. At 8:57, a security camera captures an image of McVeigh’s Ryder truck being parked outside the Murrah Building in a handicapped zone. One survivor of the blast, Marine recruiter Michael Norfleet, later recalls seeing the Ryder truck parked just outside the building next to the little circle drive on 5th Street leading up to the main entrance of the building. Norfleet had parked his black Ford Ranger in front of the Ryder. Truck Explodes - At 9:02 a.m., the truck explodes, destroying most of the Murrah Building and seriously damaging many nearby buildings. Eventually, it will be determined that 168 people die in the blast, including 19 children. Over 500 are injured. The children are in the second-story day care center just above the parking space where McVeigh leaves the Ryder truck. McVeigh will later tell his biographers that he is lifted off his feet by the power of the blast. Devastation and Death - When the bomb detonates, the day care center and the children plummet into the basement. The building, constructed with large glass windows, collapses, sending a wave of flying glass shards and debris into the building and the surrounding area. The oldest victim is 73-year-old Charles Hurlbert, who has come to the Social Security office on the first floor. Hurlbert’s wife Jean, 67, also dies in the blast. The youngest victim is four-month-old Gabeon Bruce, whose mother is also in the Social Security office. One victim, Rebecca Anderson, is a nurse who runs towards the building to render assistance. She never makes it to the building; she is struck in the head by a piece of falling debris and will die in a hospital four days after the blast. Her heart and kidneys will be transplanted into survivors of the bombing. [Denver Post, 6/3/1997; New York Times, 6/3/1997; Serrano, 1998, pp. 153-154; Oklahoma City Journal Record, 3/29/2001] Sherri Sparks, who has friends still unaccounted for in the building, tells a reporter in the hours after the blast, “Oh, I can’t stand the thought of… those innocent children, sitting there playing, thinking they’re safe, and then this happens.” The explosion leaves a 30-foot-wide, 8-foot-deep crater in the street that is covered by the wreckage of the building’s upper floors. The north face of the nine-story building collapses entirely. [Washington Post, 4/20/1995; Washington Post, 4/22/1995] Mary Heath, a psychologist who works about 20 blocks from the Murrah Building, says the blast “shook the daylights out of things—it scared us to death. We felt the windows shake before we heard the noise.” In a neighboring building, a Water Resources Board meeting is just commencing; the audiotape of the meeting captures the sound of the blast (see 9:02 a.m. and After, April 19, 1995). [Washington Post, 4/20/1995; The Oklahoman, 4/2009] Norfleet, trapped in the Marine Corps office, is thrown into a wall by the explosion. His skull is fractured, and a shard of glass punctures his right eye. Three separate arteries are pierced, and Norfleet begins bleeding heavily. Two supply sergeants in the office are far less injured; Norfleet asks one, “How bad am I hurt?” and one replies, “Sir, you look really bad.” One of the two begins giving Norfleet first aid; Norfleet later recalls: “He immediately went into combat mode and started taking care of me. He laid me on a table and he started looking for bandages to administer first aid. And while I was laying on that table, I just knew that I was losing strength and that if I stayed in the building, I would die.” Norfleet wraps a shirt around his head and face to slow the bleeding, and the two sergeants help him to the stairs, through the fallen rubble, and eventually out. Norfleet will later say that he follows “a blood trail of somebody that had gone down the steps before me” to get outside, where he is quickly put into an ambulance. He loses almost half his body’s blood supply and his right eye. He will never fly again, and will soon be discharged for medical incapacity. [Serrano, 1998, pp. 161-162] Eighteen-month-old Phillip Allen, called “P.J.” by his parents, miraculously survives the blast. The floor gives way beneath him and he plunges 18 feet to land on the stomach of an adult worker on the floor below, Calvin Johnson. Landing on Johnson’s stomach saves P.J.‘s life. Johnson is knocked unconscious by the blast and by the impact of the little boy falling on him, but when he awakes, he carries the toddler to safety. P.J.‘s grandfather calls the child “Oklahoma’s miracle kid,” and media reports use the label when retelling the story of the miraculous rescue. P.J. is one of six children in the day care center to survive the blast. [Stickney, 1996, pp. 275-277] Some people later report their belief that the Murrah Building was rocked by a second explosion just moments after the first one, the second coming from a secure area managed by the Bureau of Alcohol, Tobacco and Firearms (BATF) that illegally stored explosives. Law professor Douglas O. Linder will later write, “Both seismic evidence and witness testimony supports the ‘two blast theory.’” [Douglas O. Linder, 2006] That theory is later disputed (see After 9:02 a.m. April 19, 1995). First Responders Begin Arriving - Within minutes, survivors begin evacuating the building, and first responders appear on the scene (see 9:02 a.m. - 10:35 a.m. April 19, 1995). McVeigh's Getaway - McVeigh flees the bomb site in his Mercury getaway car (see 9:02 a.m. and After, April 19, 1995), but is captured less than 90 minutes later (see 9:03 a.m. -- 10:17 a.m. April 19, 1995). Judge Richard P. Matsch sentences convicted Oklahoma City bombing conspirator Terry Nichols (see December 23, 1997) to life in prison without the possibility of parole after his jury cannot decide whether to sentence him to death (see January 7, 1998). He is also sentenced to eight concurrent six-year terms for the deaths of eight federal agents. Matsch orders Nichols to pay $14.5 million in restitution to the General Services Administration (GSA) for the destruction of the Murrah Federal Building. Nichols swears he has only $40,000 in assets; Matsch says that any future proceeds he might receive for selling his story would be given over to the government. Nichols’s defense team tried in vain to assert that Nichols was a “dupe” of fellow defendant Timothy McVeigh (see June 11-13, 1997) and should be given a lighter sentence. Nichols, who refused to provide information about the bombing plot, gave Matsch a written apology (see March 10, 1998). Matsch says Nichols committed an act of treason that demands the most severe punishment: “The only inference that can be drawn from the evidence is that the purpose of the plan was to change the course of government through fear and intimidation.… The evidence shows to my satisfaction that the intention was to disrupt, to disorganize, to intimidate the operations of these agencies and United States government. Apparently, the intention was that the response would be fear and terror and intimidation and that these people would not be able to perform their work and that the response throughout the nation would be hysteria.… But you know, it didn’t work out that way. There was no anarchy. There was no reign of terror.… What occurred was that a community became even more united, and I think perhaps the country as well. We proceeded with the orderly processes of recovery and of restoration.… What he did was participate with others in a conspiracy that would seek to destroy all of the things that the Constitution protects. My obligation as a judge is to preserve, protect, and defend the Constitution of the United States against all enemies, foreign and domestic. Terry Nichols has proven to be an enemy of the Constitution, and accordingly the sentence I am going to impose will be for the duration of his life. 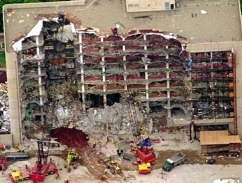 Anyone, no matter who that person might be or what his background might be, who participates in a crime of this magnitude has forfeited the freedoms that this government is designed to protect.” Prosecutors say they are pleased with the sentence, while Nichols’s defense lawyers continue to assert that Nichols did not intend to kill anyone in the bombing. Nichols’s lead attorney, Michael Tigar, files papers calling for a new trial; Matsch says he will schedule a hearing. Marsha Kight, whose daughter Frankie Ann Merrell was killed in the bombing, says: “I’m proud of what happened in the judicial system. I felt like singing ‘God Bless America.’ He got what he deserved.” [Chicago Tribune, 6/5/1998; Washington Post, 6/5/1998; New York Times, 6/5/1998; Douglas O. Linder, 2001; Indianapolis Star, 2003; Fox News, 4/13/2005] Nichols will serve his term in the “supermax” federal facility in Florence, Colorado, that houses Theodore Kaczysnki, the “Unabomber” (see April 3, 1996), and convicted World Trade Center bomber Ramzi Yousef (see February 26, 1993 and February 7, 1995). [Douglas O. Linder, 2006] Nichols refused an offer of leniency in return for his cooperation in further investigation of the bombing (see April 21, 1998).